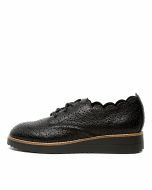 A modern take on traditional brogues, OTILA are a must-have in every woman's sartorial edit. Made from premium leather, the pair features an intricately hole-punched upper and scalloped detailing for an unfussy point of difference. Resting on slight platform wedge soles, they'll instantly elevate even the most casual looks.